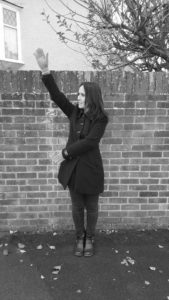 Statements in Semaphore- the weird world of crowdfunding! For the past two weeks I have been immersed in promoting my crowd funder. This process has been both exhausting and exhilarating. I decided to use it as an opportunity in my art as well as for raising funds for the project. initially I offered rewards that were simple to offer – screen prints. But I also wanted to allow this crowd funder to engage with the audience too. So I also added the chance to send me a message that I could use to project using the semaphore alphabet photos or images. I’ve added the opportunity to ‘become’ one of the semaphore photos. This started me thinking about what else I wanted to start doing with the alphabet in terms of work development. I’ve been pulled to some live action for a while and this alphabet offers an interesting range of ways to do this. I am going to plan a flash mob style live action in Kings Cross. I have an exhibition booked for the start of Feb in that area and for me if fits that the work comes out of the gallery space and into the public space. As I am interested in the power of these translations I want to explore the power of them in a very public space. Testing the nature of the visibility but invisibility of what is being said. I have offered the opportunity to join in with this flash mob via the crowd funder too, and I will be recruiting over the next few weeks. How much attention do we pay to messages? How easy is it to get people’s attention? On social media and face to face? One on one or through a crowd? On large screens or billboards? As part of promoting the crowd funder I visited 55 individual businesses in my hometown Aldershot. This gave me the chance to meet many more people locally and to talk about the work. It also felt very difficult initially, as its really a mixture of begging and selling…. This seems to be a problematic part of working as an artist. So it seems vital to me to find a way of making the process part of the work. I recently spoke with the West End centre and Rushmoor Arts hub which are both local organisations building up Arts in the area. They informed me that Art is a very low priority in the area that we live in the North east part of Hampshire. There is very little Arts participation and very little funding. This is interesting considering that we are surrounded by arts in nearby Surrey. I feel that part of this project will require me to look at local attitudes toward art, perhaps the language used about Art in the area, who artists are and who they are considered ‘not’ to be. Is it because it’s a working class area? Is it because any art created in the area – leaves? Is it just a lack of funding?